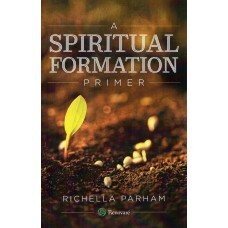 I've been out of town for the past several days, attending a Renovare' Board meeting and a conference on spiritual formation. It was a week full of blessings, but there's one in particular I want to tell you about. Our Board received a designated donation that allowed us to benefit from the services of a wonderful consultant. She spent two days with us, and we were all impressed by her knowledge and expertise, as well as by her ability to articulate her thoughts and to educate us. To be honest, I was amazed by her. She's a faithful Christian and an incredibly gifted woman, and it was a pleasure to learn from her. On Friday morning, though, we weren't in a meeting. We were walking across a college campus, enjoying the beautiful blue sky and sunshine. All was peaceful and lovely until my foot happened upon a hole in the sidewalk. I twisted my ankle and fell--down, down, down--hitting my right knee, then my shoulder, and finally my face. I was wearing a dress at the time. Of course. I should hasten to tell you that I'm fine. I was scratched and scraped, but thankfully suffered no sprains or breaks or major cuts. What's remarkable about that scene is not that I fell--truth be told, I'm rather clumsy, so I'm no stranger to falling. But almost before I hit the ground, our amazingly talented consultant was down on her hands and knees beside me. As quickly as other people were saying "Are you okay?" she had pulled out tissues and hand sanitizer. 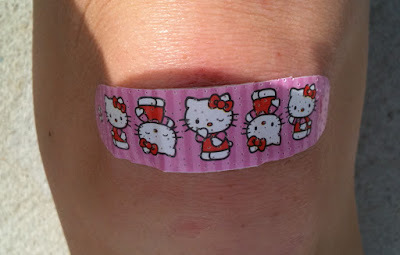 She carefully wiped off my scrapes and scratches and covered my skinned knee with--you can see it in the photo--a Hello Kitty band-aid. I don't think I would have been surprised if this impressive, high-powered businesswoman had whipped out her smartphone and called for help. But I was surprised when she so humbly and lovingly cared for me right where I was, even when that required her dropping to her knees. Her kindness was a gift from God--His grace imparted to me. Now, do you have any stories to tell of how God has imparted grace in your life? Will you share the story of a gift you've received from God's hand? It can be large or small--I'd love to hear about it! Click here to read all about this linky party celebrating God's gifts to us. Help yourself to a button and help me spread the word. I am so glad there was someone there with kindness and grace to help you out, I am so sorry for your ouchies! Wow! That is a wonderful example of service, and how God can use all of us in lots of different ways. Even your spill (which I'm glad you're OK) is being used to help convey a message. Beautiful and thanks for sharing. wonderful story of Grace Richella...I'm so glad you weren't badly hurt. I took a fall recently that was quite serious...and I'm an excellent faller too. I'm glad you are okay, and that you got such a stylish band-aid. ;) What blessing to have a helpful and kind person around when you took a spill. It makes situations like that so much more bearable! I love it when people don't do what we think they will...in a good way! :) I need to focus more on how grace is imparted to me...thanks for this! I'm glad that you weren't badly hurt and that this kind lady was right there to help you out. It is wonderful to know that people in high places can be so caring. Your spill brought out the best in her. I had an unusual experience today since you asked us to tell about ourselves. I was sitting in a rheumatologist office today waiting to be checked in. I was sitting there reading Ephesian 2 on my Palm when I was called to the desk. The backstory is that I have a lot of health issues so I was really nervous about what the doctor was going to ask me to do. She is pushing me to take RECLAST for my osteoporosis. Anyway, when I returned to my seat, Eph.2:14 was highlighted. It said, "He Himself is our peace." It was highlighted in ORANGE! I don't know how that happened. Tonight my husband showed me how to highlight by taking the stylist and underlining the verse and it showed up in yellow. However, today it was highlighted in orange. With all the other things that have going in my life today, I guess God knew that I needed something very special. BTW, I enjoy reading your blog.